In case y’all wondered just how fast that really is, I can tell you it’s right around snail pace. 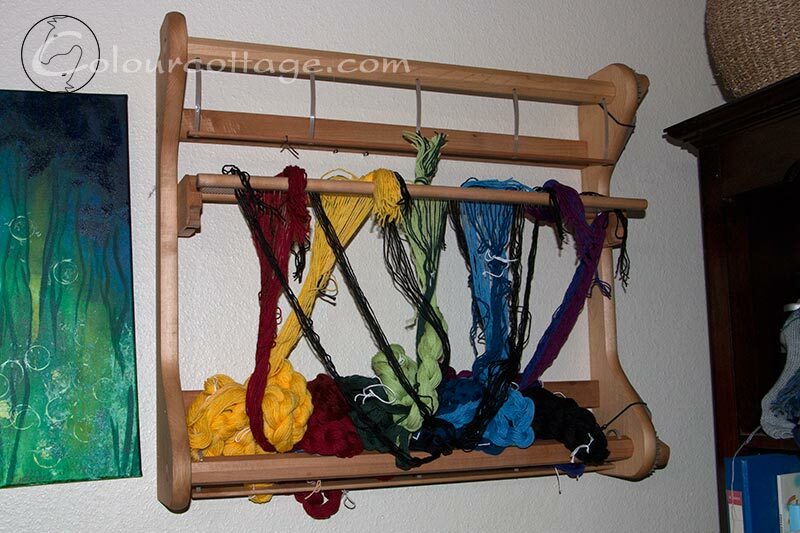 Spent a couple of hours last night threading the heddle with those colourful warp chains, then I had to finish making dinner so it went up on the wall to be cat safe. 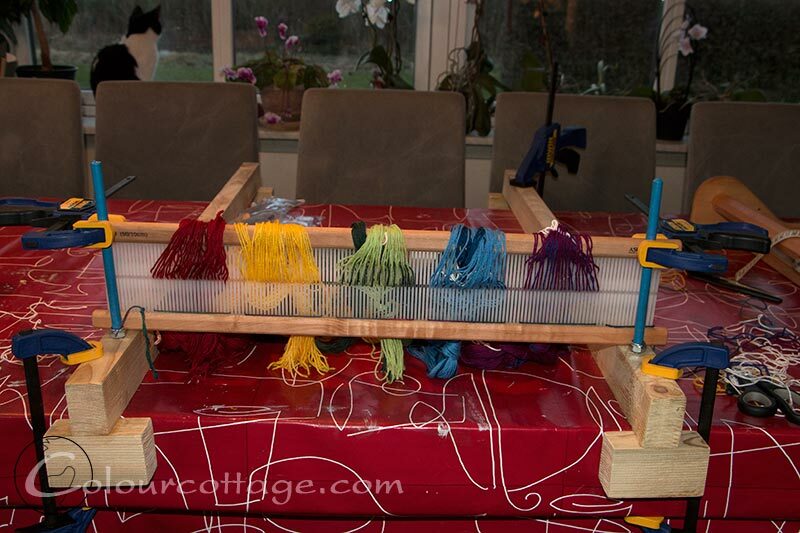 Getting some use out of my homemade adjustable warping board too. 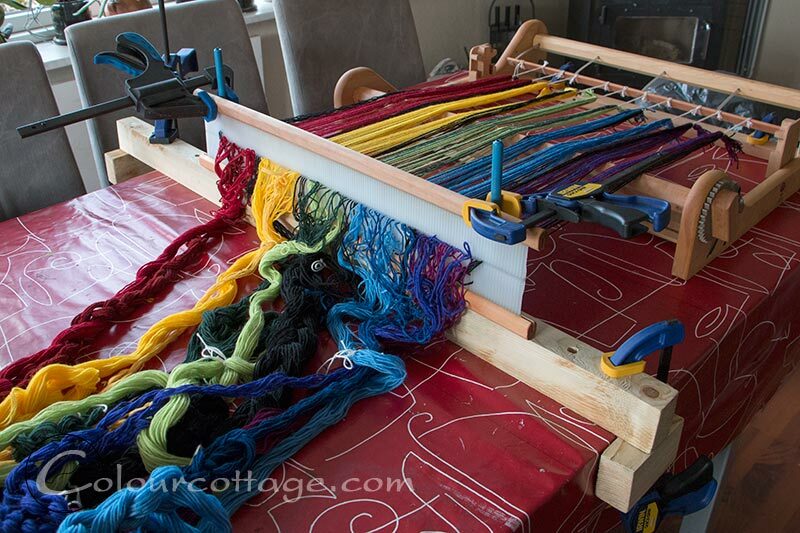 Needless to say, I’ve been rather dreading how to get this mess wound on straight to begin weaving! I’m as yet undecided whether I’ll be making squares with black lines intersecting or use a more wabi sabi saori approach. I’ll know when I see the first passes. Maybe. There will be three panels that are to be joined side by side, but even if I think I do make even squares there really is no guarantee they will match up completely at this point in my journey. Rigid heddle looms are not the most precise creatures I suspect. Now, since I did not get it done over the weekend, I was debating whether to try this on my own or wait for an assistant. My immediate response is usually the former, but it’s not always a wise choice. 😉 But it was preying on my mind, distracting me from my other tasks of the day, so I thought I could at least tie it to the beam. 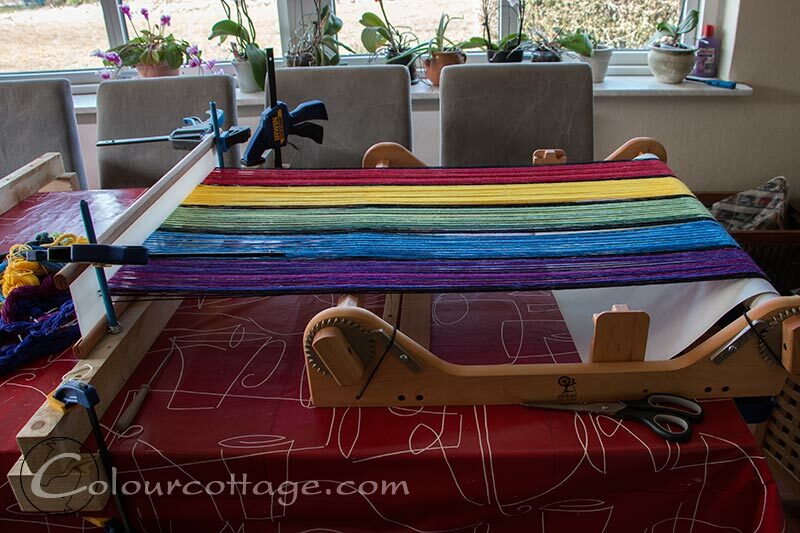 Now it’s 3.30 pm, I’m knackered, the house needs tidying, the dog needs walking, so the loom is back on the wall and I hope to get back to my paints during the week. I just wanted to have a project started that doesn’t need as much light, quiet and equilibrium. Well, it’s started! Hvor er det bare mega-flot. Hvilken farve islæt havde du tænkt på her? Jeg er også lige i gang med at planlægge at sætte en væv op i regnbuefarver 😀 Glæder mig til at se mere – og håber hesten og du har det bedre efterhånden. Jeg havde tænkt mig at bruge alle mine sjatfarvede “mini skeins” som ellers skulle bruges til sekskanter. Fordi det her garn er træls at strikke med. Desværre har jeg eksperimenteret med større tæthed i trenden i stedet for at væve en prøve først, og jeg tror måske mine fine håndmalede stumper bliver skjult mere end planlagt. Men jeg har godt nok ikke tænkt mig at pille 5 meter trend af igen!!! Looking good. I love the colours. I never could understand why warp speed was suposed to be fast! I look forward to seeing the result. 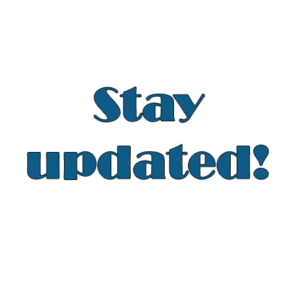 It’s quite fun not knowing quite how something will turn out but I am sure it will be a pleasant surprise! At the very least a learning experience, and we like those. I already found an intrigueing colour effect with one of the warp sequence combinations that I need to investigate in another piece. That’s what I like about working with thread though, it slows us down. And I think that is a Good Thing. Probably. Good I mean. I’m actually quite happy to fiddle with it, doesn’t slow my brain down, though. Gorgeous!! It’s worth the time you put into it!! The “warp speed” comment cracked me up..so clever! Beautiful! Certainly bringing color into the world of winter. It is wonderful that you put such creative time into your day. Inspiring! It looks so beautiful and consistent! 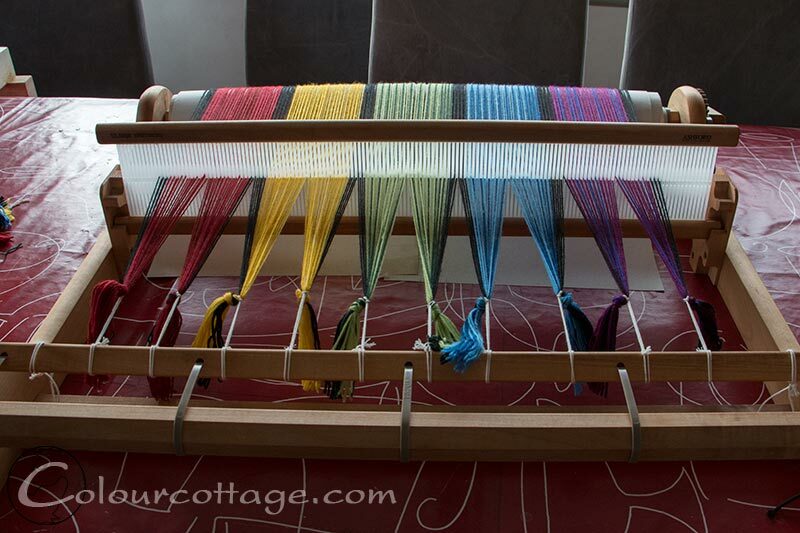 I don’t think I would be able to accomplish that on a rigid heddle loom. I also love the subtle color differences within each color stripe! Oh, those delicious colours! 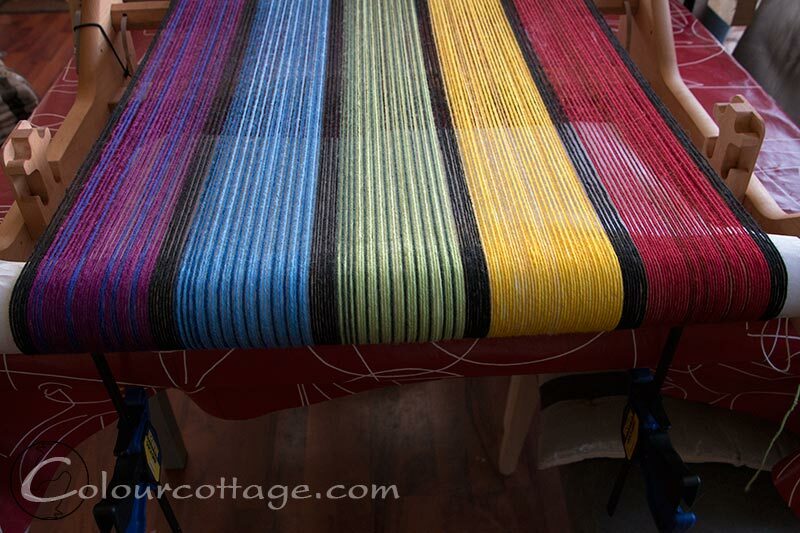 Someday I’d like to learn to weave! I love fibres and colours and the feel of real things in my hands. But right now my “weaving” is all drawing. I sometimes do the same thing as you have here — get a difficult project started in terms of laying out the materials and references, so I don’t have to deal with the dreaded organizational tasks in the morning!